Hate to generalize, but anyone within an earshot of the depressive/melancholic rock and/or metal frame is a fan of The Cure. The Robert Smith-led bunch helped pave the way for sad-man music, conjuring up a catalog that will never quite be equaled, even as bands contrived in nature try their hardest. The Cure’s influence on metal, while understated, does peak through the stained glass windows every now and again, including cover songs, by which Belgium seven-piece doomsters Fading Bliss have included on their second album, Journeys in Solitude. Engaging in a platform that is largely reminiscent of Shape of Despair, i.e. the gruff vocal/operatic female vocal tandem, Fading Bliss effectively hit it out of the park on the album’s first two cuts, “Ocean” and “Mountain.” Opener “Ocean” begins with the type of hypnotic guitar line weave that My Dying Bride specialized in during their heyday, then, the vocal layering between Dahl (growls) and Melanie (opera) moves into view. When placed over top a series of sobbing, aching riffs, their vocals are doom du jour. The ensuing “Mountain” encroaches in the same fashion, lumbering on through at half-time, spiraling riffs engulfing the frame as tender keyboard lines plot the course. Like “Ocean,” it is a song to be reckoned with. The above-mentioned The Cure cover is for “A Forest,” which originally appeared on the band’s 1980 Seventeen Seconds album. The original was a danceable trip into the heart of nascent Goth; Fading Bliss’s version is total funeral and lacks urgency and draw. The same could also be said for Journey in Solitude’s closing cut, “Desert,” which is formatted like “Ocean” and “Mountain,” albeit without the memorable guitar spirals and vocal interplay. 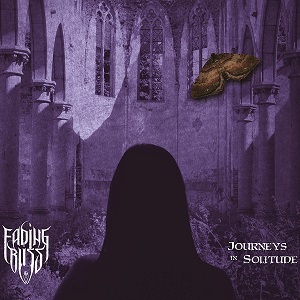 So, consider Journeys in Solitude a half-good album, but considering the strength of the album’s first two cuts, Fading Bliss could be deemed as a European Gothic doom prime mover.